Mega Sale! 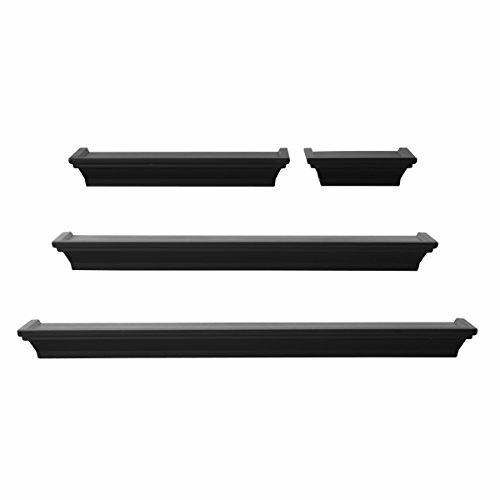 Save 27% on the MELANNCO Wall Shelves, Set of 4, Black by MELANNCO at Wow In The Details. MPN: 5091214. Hurry! Limited time offer. Offer valid only while supplies last. This Melannco Set of 4 Black Wall Shelves is an attractive way to add display space to your home. Use them for keepsakes, photos, vases, and more. This Melannco Set of 4 Black Wall Shelves is an attractive way to add display space to your home. Use them for keepsakes, photos, vases, and more. Each shelf has a lovely modern ledge design with a lip so items don't slide off the edge. Group the shelves together or hang them separately. Made of MDF wood with a classic black finish. This set includes a 6-Inch shelf (holds up to 3 pounds), a 12-Inch shelf (holds up to 4 pounds), a 20-Inch shelf (holds up to 6 pounds), and a 24-Inch shelf (holds up to 8 pounds). Hanging hardware, template, level, and instructions are included. This set of shelves will hang flush against the wall. Each shelf features 2 hanging hardware brackets.Wipe clean with a dry cloth when needed. View More In Floating Shelves. If you have any questions about this product by MELANNCO, contact us by completing and submitting the form below. If you are looking for a specif part number, please include it with your message.